Former Shamrock Rovers and Sheffield Wednesday footballer. UCD are one of the best football teams in the country, and I include both Premier Division and First Division in that. They passed Waterford off the pitch at The Bowl last Friday on their way to a 2-1 win and an away tie with Dundalk in the FAI Cup semi-final. Collie O’Neill and his team know they’ll be the underdogs at Oriel Park in a couple of weeks, but they’ll show no fear and are in with a fighting chance of making it to the Aviva Stadium final. Before that, they can clinch the First Division title with just a draw at home to Finn Harps tomorrow night. What an achievement it would be for this young team to win promotion to the Premier Division. Having been relegated in 2014, they’ve spent four seasons in the second tier and nobody tipped them to be automatic promotion contenders at the start of this year. This brilliant team have proved everyone wrong and have just one more hurdle to overcome. It’s very simple for The Students: pick up a point and they are champions. Harps are the only team who can catch them but they come into the game five points behind with just two games left, including tomorrow. If Ollie Horgan’s team inflict just UCD’s second home league defeat of the season, they’ll be two behind on the final day. UCD are away to Longford, while Harps host Cabinteely next Friday. Things could get very interesting if things don’t go UCD’s way, but if they perform like they have for much for the season, they’ll be on the champagne at 10pm. Watching UCD against Waterford on Friday, you’d have been forgiven for thinking that The Students were the team competing for Europe towards the top of the Premier Division. They played their usual classy, confident, passing, attacking football. They stuck to their style scored two brilliant goals via Conor Davis and Timmy Molloy and swept Waterford aside, with Stanley Aborah’s late penalty a mere consolation. From goalkeeper Conor Kearns, through centre-backs Josh Collins and Liam Scales, captain Gary O’Neill and midfield partners Greg Sloggett, striker Davis and winger Neil Farrugia for example, the common denominator is calmness and ability on the ball. The pace of the excellent Farrugia and the in-form Davis caused Waterford problems all night, and allowed the other players above and full-backs Dan Tobin and Evan Osam to get on with the job of creating chances. It’s not a coincidence that this team play the football they do, it takes a lot of hard work, practice and bravery from everyone involved. The UCD model is one that every club in the country should be envious of. The lads train on the pitch twice or sometimes three times a week, combined with team and individual gym sessions plus their game on a Friday and recovery session on a Saturday. The difference between them and a lot of the other teams is that they transfer their attacking, passing style from their training sessions to the pitch on a Friday night, as they showed against Waterford and as they’ll show against Finn Harps and Dundalk in the cup-semi final. Many teams will do passing exercises and possession games in training and even in their pre-match warm up, and then when it comes to match night, they revert to long ball stuff! UCD play by design, and not off the cuff and that, along with their talented manager and excellent players, has created a team on the cusp of winning the league, in a division with many ‘bigger’ clubs. The fact that the whole squad are in the college (or coming into the college in a couple of cases) means that these players also play together for one of the top university teams in the country, meaning they get extra sessions and extra competitive games together. All of these lads feel they a professional football career is achievable for them and they put as much into their football as they do their education which is a fantastic combination. Comparisons have been made to the UCD First Division-winning team of 2009. I played in the final third of that season with players who are now at the top of the domestic game. Greg Bolger and Ronan Finn are two of the best midfielders in the country, Dave McMillan is a former top scorer in the league before his move to Scotland while others like Keith Ward, Evan McMillan, Andy Boyle and Ciaran Kilduff were also in that team. The club remained in the Premier Division for five seasons before relegation in 2014. 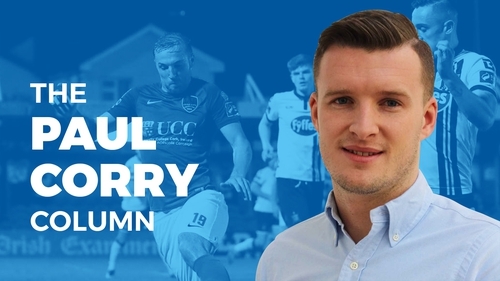 Others like Mick Leahy and Dean Clarke (now St Pat’s), Robbie Benson (Dundalk), Paul O’Conor (Bray Wanderers) and others starred in the team during their Premier Division run. More recently, Georgie Kelly left as the First Division top scorer at the time to join Dundalk and has been on the scoresheet a couple of times already for his new club. Players and coaches come and go and UCD have had a high turnover of both in the ten years since I joined in 2009, but their ethos, model and playing philosophy has not changed and when you combine that with good players being allowed to express themselves, the results can be fantastic. Barring an upset, UCD will be SSE Airtricity League First Division Champions come close of play tomorrow night, they’ve beaten Finn Harps on both previous meetings this season and will want to win it in style with three points against the only other team who can win the league. They know a point will do but that would be a dangerous attitude to take heading into the game, and they won’t want things to go to the final day. What better way to get ready for that huge semi-final in Dundalk by bagging a league title they fully deserve. Good luck to Collie and his team, just one more step to a great achievement.